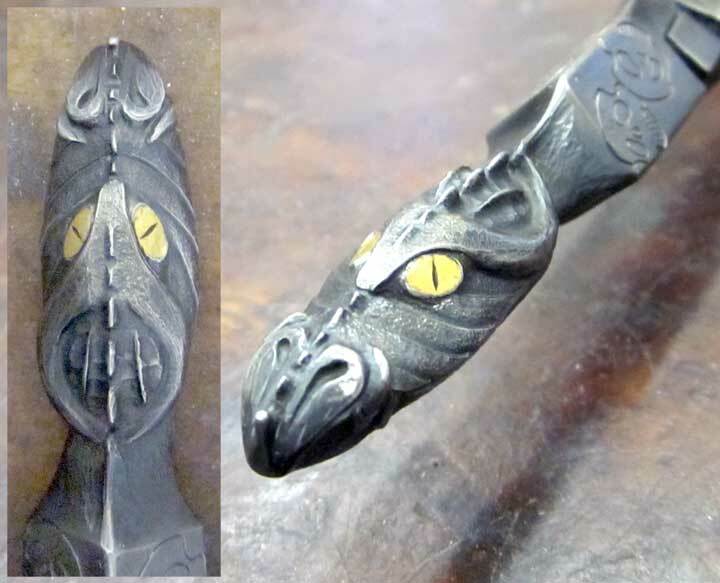 I finished the gold inlay for the eyes, and began carving the pile of skulls just below the dragon pommel (she’s been really hungry lately…) After transferring my design, I engraved all the lines (above). Above, from left to right, I’ve been relieving the background around the skulls with a large round carbide bur. You can see all four sides. And here are a couple of side views of the same. Above, I continued relieving the background with smaller and smaller burs (far left), and then began rounding over the edges of the skull, again with smaller and smaller burs, adding more and more detail and sculpting. And, above, that’s all she wrote for today. 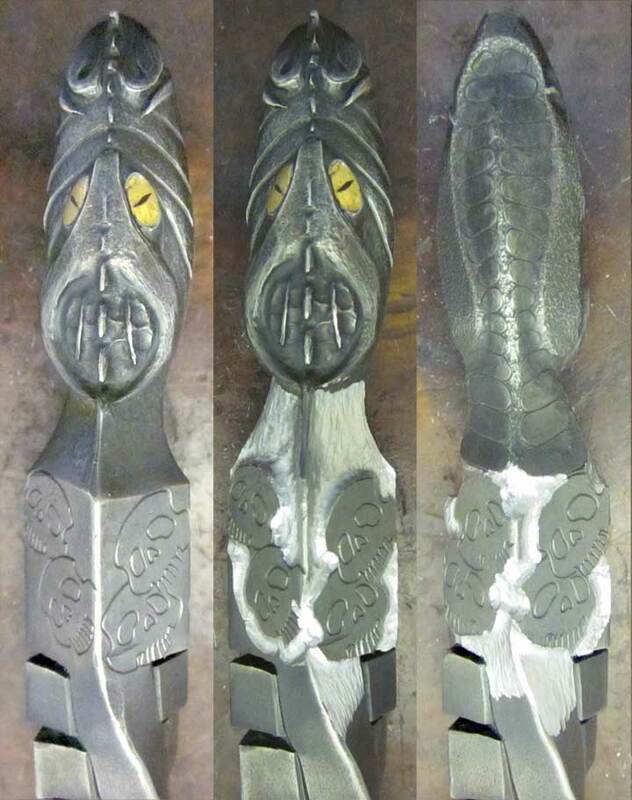 I’ve finished sculpting two sides, and also have smoothed the bur marks out by sculpting (forging) with a flat punch. Tomorrow, I’ll use a V-graver to put back the tooth detail I carved away while rounding things over, and cleaning up around the edges of the skull. 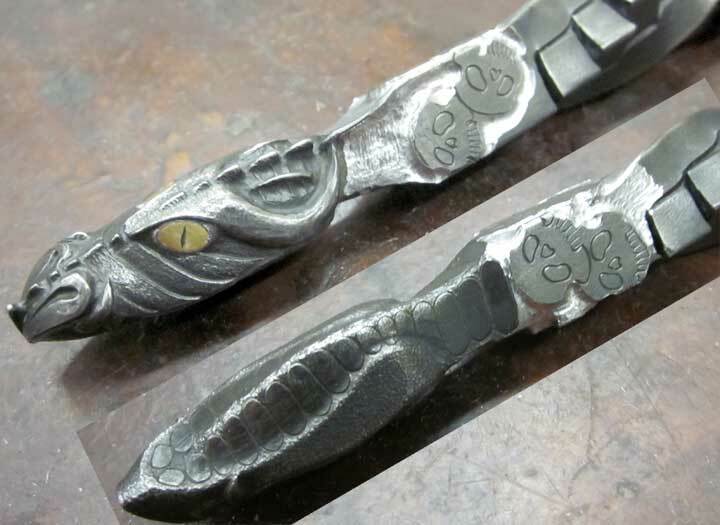 This entry was posted in Carving, Engraved Knife, Misericordia and tagged carving, dagger, engraved, engraving, fabricated, fabrication, knife. Bookmark the permalink. That is superb work Tom. Are you primarily using the nitro? Thanks for the kind words. I use both my Lindsay Palm Control Classic and my Lindsay Nitro G-20. The Palm Control I mainly use for general engraving, and the Nitro is my go to for punch sculpting, although I did use the extra power of the Nitro for engraving the four REALLY DEEP lines for the Rubik’s Cube twist for the handle. Also, I use my NSK electric micromotor grinder with carbide burs for carving even more than the airgravers, although flat gravers in my Palm Control help a lot for carving as well.